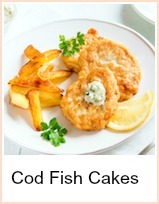 This fishcake recipe is very versatile. 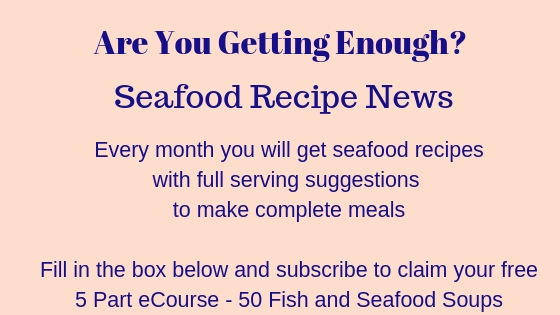 People don't buy fish much - they're a bit scared as they don't know what to do with it. As a consequence, you will often find fish in the 'marked down' section of any supermarket. 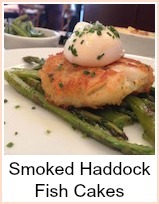 Peppered mackerel, wet fish, smoked fish - anything that's 'on offer' will do. The horseradish is very good with mackerel - it cuts through the oiliness of the fish - if you use oily fish, then you must have horseradish - even a little bit if you're not keen on the hotness of it. 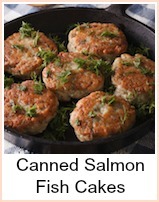 8 ounces of fish will be enough to make this fish cake recipe - that can be any mixture you like - more fish will make 'meatier' fish cakes, but as a minimum, aim for around 8 ounces. To make breadcrumbs, take some slices of bread and either process them in a food processor/blender or work through a grater. Take a large bowl and mix together the potato, onion, horseradish and fish. Divide the mixture into 8 and form into flat cake shapes. 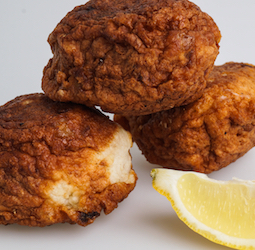 Roll the fishcakes into the flour, then dip in the beaten egg and coat with breadcrumbs. Allow to chill in the fridge if you have time for about 1 hour. Shallow fry the fishcakes for about 5 minutes either side until golden and hot all the way through.